How can the concepts we have learned so far be used to explain the fluctuations in the stock market? How are those fluctuations reflected in the changes in the value of your portfolio? · Using the SMG Portfolio rubric, each portfolio will be assessed on being current, complete, and accurate. · What is so special about money? · Ask students to see a large bill ($50 or $100 is best) and hold it up next to a $1 bill from teacher wallet; Compare bills for size, shape, color, material, artwork – hand $1 bill back to student. · Class discussion about the nature of money and how it gets the value it does. · How does the U.S. banking system function? · Brief overview of the history of banking. · Divide the class into four groups. One group searches commercial banks, one savings and loan banks and credit unions. Each group will research for ten minutes and then explain to the class what their institution does. The fourth group will research the Federal Reserve System. · Presentations should cover: history, primary customers, purpose. · The Fed group will then tell everyone exactly where each group fits into the banking system. Read: “Trump’s Negotiating Mind Games” and "Trump on Negotiations"
The candidates will produce a live auction to benefit The Pediatric AIDS Foundation. Each team will negotiate with five of the biggest artists in the music industry for a personal experience to be auctioned. The team that raised the most money for the charity will win. Assignment: Complete the Apprentice Assessment worksheet. Activity: Teams will take on the roles of Union representatives, Business Management, and Company Shareholders to successfully negotiate a contract for the employees of the company. Students should be able to draw the path a check takes through the banking system and be able to explain how the reserve accounts in each bank change as the check moves through the system. What is the structure of the Federal Reserve Bank, and how does it function? · Federal Reserve Group (from Lesson 3) will divide between the other three groups and lead an examination to the role of the Fed. Items to examine: control of the monetary supply, Federal Reserve structure, interest rates. 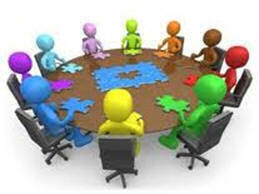 · Teacher will conference with each group to assure understanding. How does the Federal Reserve Bank regulate the U.S. economy? · Teacher-led discussion about the role of the Fed as the bank of last resort. Dissection of the 2007 financial collapse focusing on role of commercial banks and the Fed’s actions to moderate the crisis. The teams’ next task will be to put on their own do-it-yourself clinic at a Home Depot store. Their clinics would be judged on originality, product placement, and customer involvement. Angie volunteered to be Project Manager for Net Worth while Craig reminded Magna that he was the only one who hadn't been Project Manager, and that his time to lead had come. How does the U.S. financial and banking system function on the world financial stage? Teacher-led small group discussions about international monetary systems and exchange. The purpose of this lesson is to understand how U.S. dollars became the dominant medium of exchange in the world and how they interact with the currencies of other countries. The impact of Federal Reserve policy on international markets will also be examined.